Mary L. Caruso, 60, of Easton died Friday, May 28 (1999), in her home. She was controller and secretary-treasurer of G. Piscitello and Son, Inc., in Wilson Borough. Born May 20, 1939, in Easton, she was the daughter of Sarah Panto Caruso of Easton and the late Michael Caruso. She was a member of St. Anthony of Padua Catholic Church in Easton, where she was a cantor, member of the choir, and a member of the Sacred Heart Sodality of the church. She was president of the Holy Cross Ladies Auxiliary of Easton. 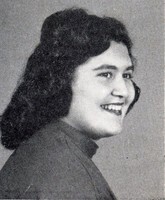 She was a 1956 graduate of Easton High School and attended AIB classes at Lafayette College. In addition to her mother she is survived by a sister, Emily of Easton. A brother, Joseph, died on June 17, 1997. Services will be held at 9 a.m. Tuesday from the Morello Funeral Home, 12th and Lehigh Streets, Easton. A Mass of Christion Burial will be celebrated at 9:30 a.m. in St. Anthony of Padua Catholic Church, Easton. Call after 7 p.m. Monday in the funeral home. Burial will be in St. Anthony's Cemetery in Williams Township.